Recently, I set out to discover which flight search engine offers the cheapest fares on average. When I started, I didn’t think that there would be much difference from one site to the next, but boy, was I wrong. In fact, did you know that the site you use to book your flight could potentially cost you thousands of dollars? Think I’m joking? I’m not. The full details are below, but on average, picking the wrong site when looking for flights will cost you $272. My entire methodology is explained below, but let me start by saying that this post is not sponsored by any website. I started this research out of my own curiosity and all research was conducted independently. So, which airfare search engine is the cheapest? Keep reading to find out. I conducted 100 different flight searches over the course of about 5 weeks. I picked flight dates and airports at random, but started and ended searches on all six continents with regularly scheduled service. All searches were done for a single roundtrip ticket. Furthermore, all searches were done on each site within a period of approximately five minutes or less. This kept the odds of prices changing to a minimum. 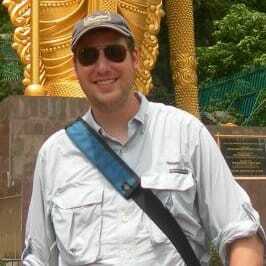 The eight sites I used were: Kayak, Momondo, Bing Flights, SkyScanner, Mobissimo, Hipmunk, OneTravel, and Vayama. There are others out there, but these eight airfare search engines provide a good baseline for the most commonly used sites. As I stated above, I was surprised at how much difference there was between the results found on the sites. While prices for flights do tend to fluctuate frequently, the commission margin on flights should result in fairly similar fares across the board. However, what became clear to me is that not all the search engines provided the same quality of results. For example, of the 100 searches conducted across these eight websites, five percent of the results had more than a $1,000 difference between the lowest fares found by each site. What this means is that if you had only searched one website, you could be costing yourself a lot of money, up to $2,912. That’s right, one flight search gave me a difference of $2,912 between the lowest prices offered on a single, roundtrip ticket from Mexico City, Mexico, and Reykjavik, Iceland. However, this was only an 87% difference in prices. The award for largest percentage difference was 150% on a flight between Charleston, South Carolina in the US, and Manzanillo, Mexico. Overall, the differences between the lowest fares found by the different sites was $272 or 25%. Not a small amount of money for a single, roundtrip ticket. And, while most of the flights obviously had more manageable differences, every single flight I searched offered a variety of fares depending on the site searched. So, which Flight Search Engine is the Cheapest? Based on my data, the cheapest airfare search engine was Momondo.com. Maybe their flights are less expensive because they don’t advertise a lot, I don’t know. However, they were consistently among the least expensive search engines, providing the cheapest flight (or close to the cheapest flight) 60% of the time. They also had results that were, on average, $20 less than the next closest site. The most expensive flight search engine? Hipmunk.com, which provided the most expensive search results 29% of the time. 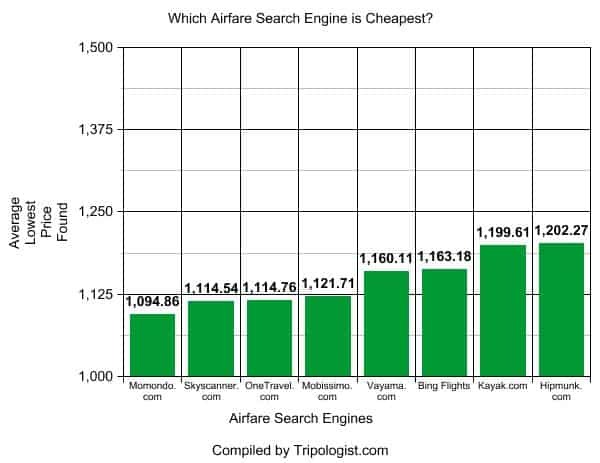 Even worse for Hipmunk, their search results averaged $107 more expensive than Momondo. Which airfare search engine is the cheapest? Kayak’s slogan recently has been “Search One and Done”. Given their high prices, I can understand why they would want you to do that. However, regardless of which site you use, I would never recommend searching just one site. Even Momondo.com, which offered the lowest tier fares 60% of the time, still provided one of the highest priced fares 2% of the time. Ultimately, this is just a cheat sheet to help you figure out where to start your airfare search. In order to find the best rate, always check more than one airfare search engine. Do you have a favorite airfare search engine or one that you think is the cheapest? Let me know in the comments below. I usually use Kayak to compare airlines and then book from the actual airline. I don’t think I’ve ever booked on any of these sites. I also live in Memphis, where the airport is sad and there aren’t many choices. But you do present some websites I will look at in the future. Most of these sites are search engines, just like Kayak, so you don’t book directly on them. If you’re just looking at Kayak, be careful. There were a few times when Kayak was over $1,000 more than the best prices I found. It would’ve been great to see you include adioso.com. They are almost always cheaper than the other engines for me. I haven’t heard of Adioso.com, but will definitely check it out. Might be a good one to include if I ever do an update on the research. Thanks for the tip and comment, Talon. Nicely done! I agree that checking multiple sites is best, though I favor Skyscanner (for overall comprehensive airlines included and their interface) and adioso (which you didn’t review – but you simply can’t help but love their pretty interface). Still, after all is said and done, I double check directly with the airline to see if I can get an even lower fare there. Interesting Data and thanks for sharing. 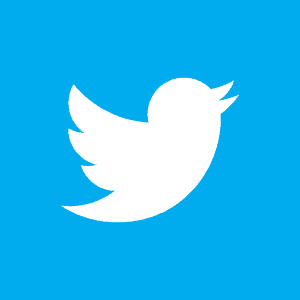 1) Within 5 minutes of each other – that can make a difference in our experience. Really depends, but it can. 2) When you did these searches, did you click through AFTER seeing the price to see if that fare was actually available? In our experience and research, it is NOT always available. Some sites more than others. We did a study 3 times in 2012, and have a massive update coming soon on Around the World Tickets – so it’s not the same, but related. Fun stuff. It is a moving target and very much a commodity. 1) This is true. I used to be a travel agent, so I’m well aware. To try and combat this, I would frequently alter the search order to try and make sure one site wasn’t always first or last. 2) I didn’t always try and book a ticket, but whenever the percentage or price difference was exceptionally high, I would click through to the booking site and go as far as I could without entering payment. Fares recorded were as accurate as I could make them. I used to use travelsupermarket.com – I don’t know if you have any experience with that? That is interesting about kayak. Their multi-city option can be pretty amazing though. I booked Christchurch NZ to Johannesburg SA (with a 6 day Abu Dhabi layover) and then Cape Town to Bangkok all for $1,100. It was significantly cheaper than any other website I checked. That said, I’ve not heard of the lowest cost one you reviewed. I will check it out! Kayak does have some nice features, and that sounds like a pretty good deal you got. Obviously, checking complicated multi-stop fares would have been nearly impossible on a large scale, so it’s certainly possible that Kayak is great with those. Thanks for the info, Dan. Great stuff Jim! I always hear about a new search engine when I see one of these. Thanks for getting this info out there. Great discussion and excellent tips in this comment thread! Thanks for starting the conversation, Jim. I haven’t heard of some of these sites before, but I’ll definitely be using them when I research my next trip! Cheers. Fantastic information, Jim! I’ve never heard of Momondo but did a quick test of my own and they beat out Kayak by quite a bit. I was surprised when I found the same, Tim. I guess it goes to show you that the most well known site isn’t always the best. Google Flights is definitely a good one. The reason I didn’t include it was because, at the time of my testing, it was limited to flights that either started or ended in North America or Europe. So, for many of the searches I performed, it simply brought back no results. Therefore, I couldn’t get an average price that based on the same data as the other sites (though the data I was able to get put it in the middle of the pack).